Adding a tweeter to a guitar amp? I've got a little Roland Micro Cube guitar amp. The original speaker (about 4") was great, but farted and flapped at the bottom end on a couple of the models - it just couldn't really cope. I found numerous examples of people replacing the speaker with a bigger one, so I've done that, using a Jensen 6" (also 4Ω) guitar speaker that had been well reviewed for exactly his operation. It works OK, and it certainly sounds much bigger, warmer and able to cope with the bottom end, however, nearly all the top end has simply vanished. With the original speaker, I usually set the tone control on about 50% - above that and it sounded very spiky - but now it sounds fairly muddy even with the tone up as high as it will go. Because I heard the system before, I know for sure that the issue is the speaker and not the guitar or other electronics. So I'm wondering how to fix this - my first thought was to install a piezo tweeter (which I understand can be done without using a crossover) to restore some of the top end. I know that another approach would be to use a full-range speaker (thus relying on the sound of the amp models rather than anything the speaker is doing), but I suspect this would be more expensive. Re: Adding a tweeter to a guitar amp? I must say that if all your top end had disappeared, then those reviews saying how wonderful the Jensen was, I find to be highly suspect! I'd be tempted to put the old speaker back and live with it. It's actually a 5" and rated at 8 ohms (though if you've made a larger hole for the speaker then this won't be possible). If you haven't made a larger hole, then I suspect this may well be where you are loosing some top end due to reflections from the edge of the baffle causing phase cancellation and affecting the motion of the cone. 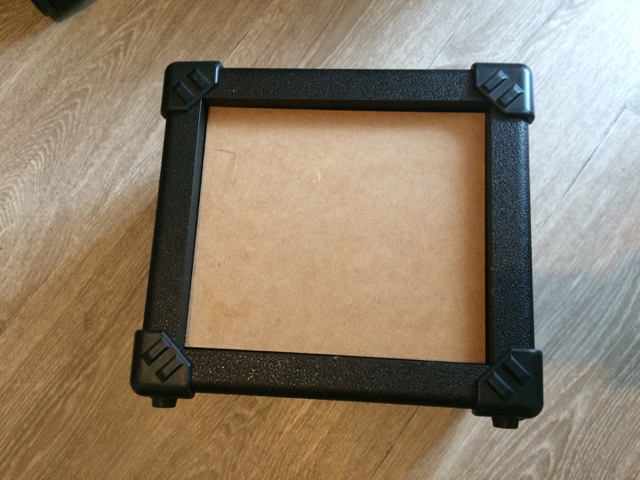 This is the original speaker: https://www.thomann.de/gb/roland_replac ... o_cube.htm A 2W speaker in a 2W amp is always going to be a bit suspect when pushed hard. But if your replacement is 4 ohms (remembering the original is 8 ohms), then that may also be the cause of your issue, as the amp's output may not like 4 ohms and may need 8 ohms as a minimum. If you've enlarged the baffle hole, then you could parallel up a piezo with the main driver, though you'd have to mess about with series resistor values to get the output level right. And it may then sound pretty fizzy. The amp models may be passing through an EQ that's been tweaked just for that 5" speaker. Then again it may be a generic model setting, which is why the bass end is excessive (for the speaker's capacity) on some of the amp models. I think Wonks is on the right track when he says the amp might be "voiced" for a full range speaker and a proper guitar speaker now sounds dull. The current rage for modelling amps shows this. Many are actually full range power stages and full range speakers so that an AUX input sounds fairly "hi fi" but the actual guitar section has the restricted upper range that would be inherent in a guitar drive unit. As to fitting a tweeter? Not recommended but if you have one handy try it and yes, if a piezo unit you just need a limiting resistor of about 5 -10 Ohms. 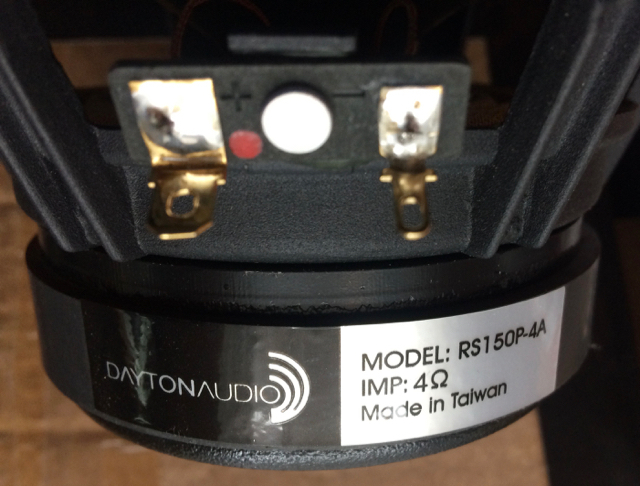 You could use a conventional moving coil tweeter (sweeter than a cheap piezo!) and in that case you need about 2microfarads non polar in the circuit. Meant to add. Never fit a tweeter to a "serious" guitar amplifier of anything above about 5 watts, especially if a valve output stage. Guitarists love distortion and tweeters can be burned out by a relatively few watts at 3 or so kHz. It will in any case sound horrible! Thanks for the replies. I quite agree about the reviews - it's really quite disappointing. Ted Weber speakers were better reviewed for this swap, but they seem quite hard to get hold of, and I think they would be similarly voiced. 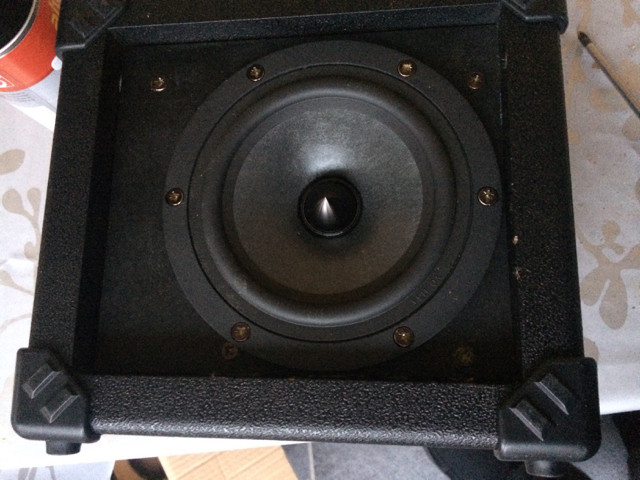 The original speaker is mislabelled as 8Ω on Thomann - it's definitely 4Ω - if you look at the pictures you'll see the speaker says 4Ω on it, as does mine. It's notable that the magnet on the original speaker is about twice the size/weight of the Jensen; I'm not sure what effect that would have. The top end isn't entirely missing, there's just much less of it - it's most noticeable on clean sounds like the JC, and the chorus and reverb lack the sparkle they had, and the rectifier model has lost lots of bite. Indeed I suspect that the original speaker is more full-range, just lacking in bottom end because of its size. The original speaker was mounted on the outside of the baffle; I mounted the new one on the inside (there's slightly more space), resulting in a small reduction in cabinet volume, and it also partly covered the (small) port - I would expect both of these things to result in less bottom end rather than more, but I don't think that's a major factor here. I've gathered that tweeters are not really a good idea - I can see it getting easily out of balance and sounding too scratchy, so a full-range speaker would be a better bet. Full-ish range 6" 4Ω speakers are not that plentiful, but I found Dayton Audio's RS150 models which are reasonably priced. They make two options with paper or aluminium cones. The paper cone seems to have much less top end on their spec sheet, but says it's good for 10KHz. The alu one says 4KHz, despite its freq graph looking better at the high end. Which do you think would work better? Both look much smoother in the midrange than the Jensen too - the aim here is reproduction of the models rather than have the speaker add its own opinion! 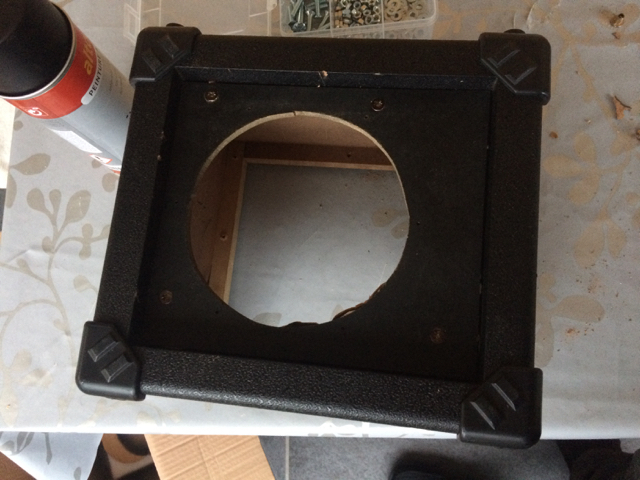 So I think this Jensen will be going back to Thomann; I don't really have the option to revert to the original as I have of course made a bigger hole in the cabinet. Buying by mail? then buy both and return the one you like least? The paper cone has the smoothest frequency response, so will probably be the best fit unit. The aluminium cone unit is probably listed at 4kHz because of the dip in response centered at about 4.5kHz, so it does fall below the 1kHz dB figure by 3dN at 4kHz, but then it does pick up again afterwards and looks good up to around 17kHz. They are probably being very precise in their descriptions, other manufacturers do tend to use -10dB points rather than -3dB. Having looked at the Thomann picture I now agree with you. 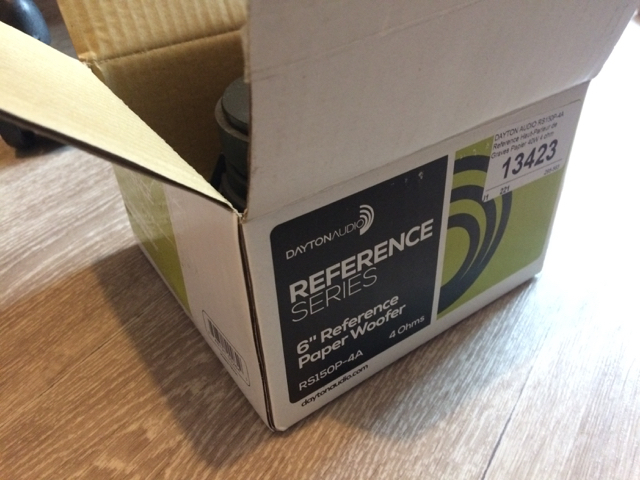 I've emailed Thomann about that Roland speaker impedance, so hopefully they'll correct the description (or else tell me it's been incorrectly stamped, when a quick check with a multimeter should settle things). I'd still recommend enlarging the speaker hole in the baffle so that none of the cone is covered. The Dayton appears to have a rubber or foam ring around the cone, so I'd suggest all of that should really poke through the hole. Marcus Bointon wrote: So I think this Jensen will be going back to Thomann; I don't really have the option to revert to the original as I have of course made a bigger hole in the cabinet. I thought it was referring to the mounting holes for the speaker. Maybe Marcus can confirm? The Jensen is too large to fit on the outside of the baffle; the structure of the cabinet is such that the front of the baffle is slightly smaller than the back (inside), there being a lip around it on the outside. 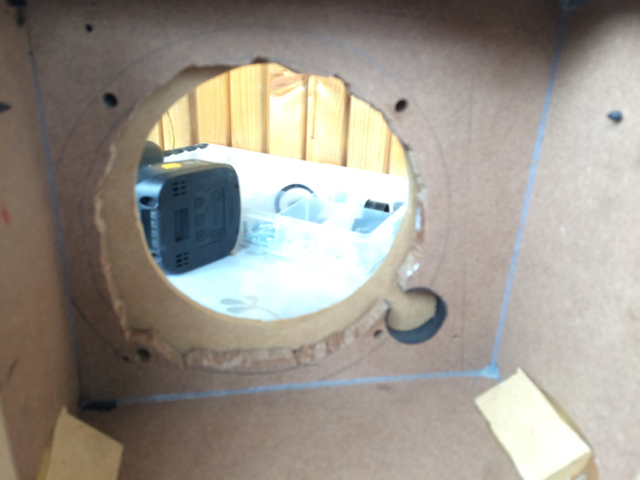 I enlarged the speaker hole (which is quite difficult as the MDF is surprisingly tough and the external lip gets in the way so you can't use a jigsaw on it) and then mounted the speaker on the back - all of the cone is visible from the outside. 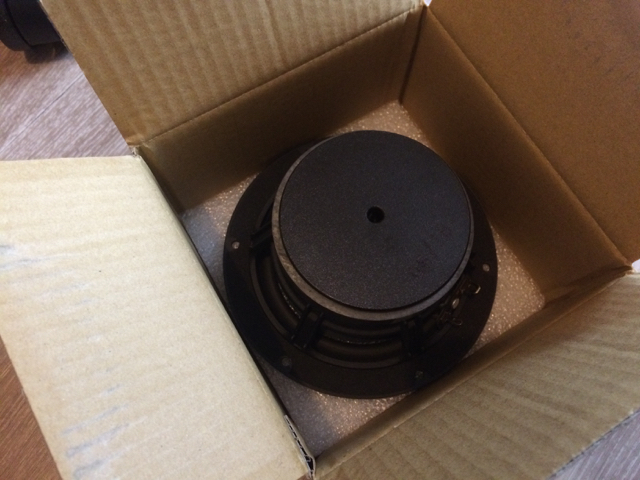 The Dayton speakers are actually a bit smaller - the Jensen is really 6.5" rather than 6" - so I think I will make an overlay for the baffle and mount the smaller Dayton speaker on the outside, which will be much neater, deal with the now-too-big hole, and also allow more room for the deeper driver. The mounting holes are fine - I was able to redrill them appropriately and re-use the Roland bushes for the mounting bolts. I saw that 4.5k dip too - I suspect that there wouldn't be much practical difference, but I'll see if I can get the paper version. It's interesting to compare them with the Jensen's official curves - the Daytons are a lot flatter; the Jensen has a big 150Hz peak, a midrange dip, and less top end which probably explains the muddiness relative to the stock speaker. Meanwhile, I love this little cube - it's hard to believe such colossal noises come from such a small box! It sounds like it's all coming together nicely. So best of luck and please do let us know how you get on. Yeah, keep us posted, I have a MicroCube and plan to use it with a looper and my Gypsy Jazz guitar for busking at some point. A little more low end would be good. You'll always be limited with a 5" speaker. The cab is already ported to help extend the low end, and fitting a different speaker with different resonant peak and Thiele/Small parameters won't get the best from the cab, though a closed enclosure might end up being better sounding and stop the low end being flappy at volume. Marcus, you might want to try temporarily blocking off the bass port when you fit the new speaker and see what difference that makes if it still sounds a bit loose. A side question. It's a Roland Microcube - nothing wrong with it but hardly the most, how to say.. boutique amp ever. Is it worth going thru all the pain (and cost)? Swap here, swap there you end up paying quite a bit of dosh and time which you could use on something else (even an equally capable modeling amp). Don't get me wrong, I usually try and answer the question and avoid ..questioning it, so apologies in advance for that. And of course if it's a fun learning project it makes perfect sense. I can now report that Thomann have adjusted the replacement speaker ohmage description to 4 ohms after my email to them. My speaker finally turned up this morning, so I put it all together today. The Dayton speaker is very nicely made. The cone is quite a lot smaller than the surround, but it's still bigger and generally heftier than the original. The exact model number is RP150P-4A, which means roughly reference range, 150mm, paper cone, 4Ω, and I don't know what the A means - it seems to be a new model though, distinct from an earlier "P-4" model. The paper cone version is rated up to 10KHz, considerably higher than the plastic version. The centre pointy bit remains stationary and the cone moves around it. Having made a mess of the front panel for the Jensen, I got a little piece of 6mm MDF cut to 156x178mm, which is a pretty good fit. 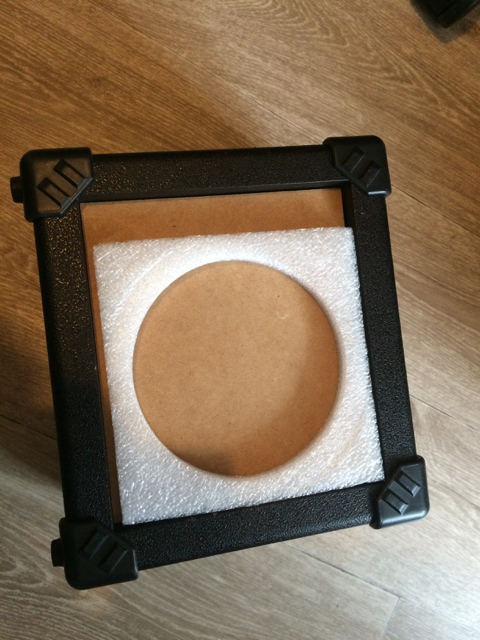 Th packaging comes with a bit of foam that happens to have a hole in that's exactly the right size for mounting the speaker, so use that as a template. 12.5cm of glorious round hole (woohoo!). I made it off-centre so as to leave space for a port if necessary. Now you can see quite how grim the previous attempt was... You can see the original port, which I did not keep or replicate. 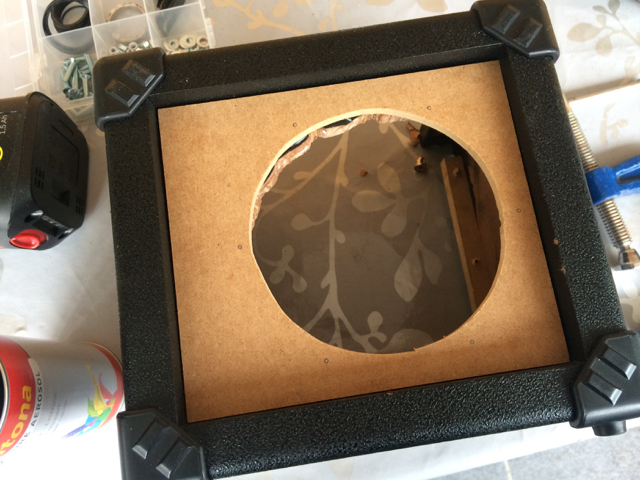 and then drilled pilot holes and mounted the new speaker with wood screws - the 6mm MDF is not thick enough to use the original bolt mountings. I coloured in the screw heads with a black sharpie to keep it low-key. The extra panel means that the speaker is 6mm further forward than the original, but there's enough of a rebate for the grille to still fit in front of it. So how does it sound? Well, much better than the Jensen - all the top end is there. There's definitely more low end and I can now play the "black panel" model without it sounding flappy. The "classic stack" model seems a bit warmer - though of course I can't A/B it now. As for cost, well to let you in on a secret, I only paid €30 for the amp at a local car boot, and the speaker cost me €58 delivered from Audiophonics here in France, so the whole thing has not cost me much at all, and I'm very happy with the results. Overall I definitely recommend the Dayton over the Jensen - it's a better fit, retains the top end, and sounds better than the original. I'm not sure I'd officially class the original hole as a 'port' , but I'm not lamenting its disappearance.